After welcoming two babies into the world around the same time, friends Karin and Nina knew they needed a creative passion project. By utilising each of their complimentary skill sets, Dreamers Inc was born. 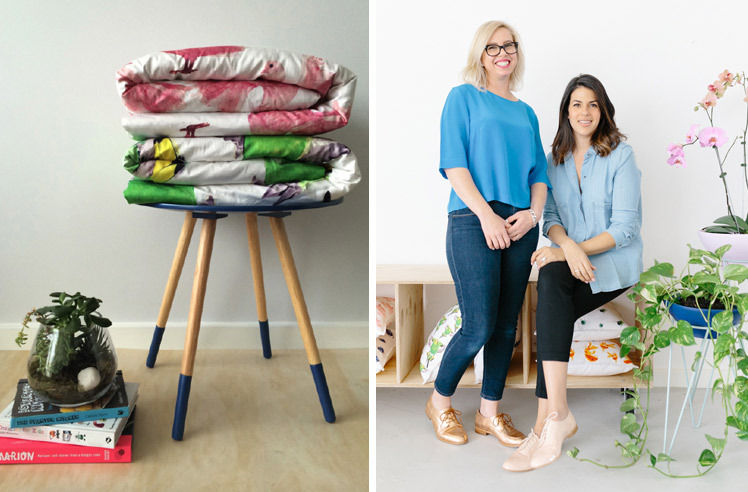 Today we chat with Nina and Karin about what it means to launch a successful bedding label in this competitive market. Tell us a bit about Dreamers Inc and what products we can expect to discover? We started talking about creating Dreamers Inc. around November 2013. We had both given birth to our second children within weeks of each other. Both having had a creative past, throughout our children’s’ first year, we would often speak of our desire to work again. At some point during one of these conversations, throwing ideas around, we decided to evolve the idea of a collaborative brand. Our different aesthetics drew us closer together. We felt like we could utilise each other’s strengths to create a product that would appeal to a broader market. 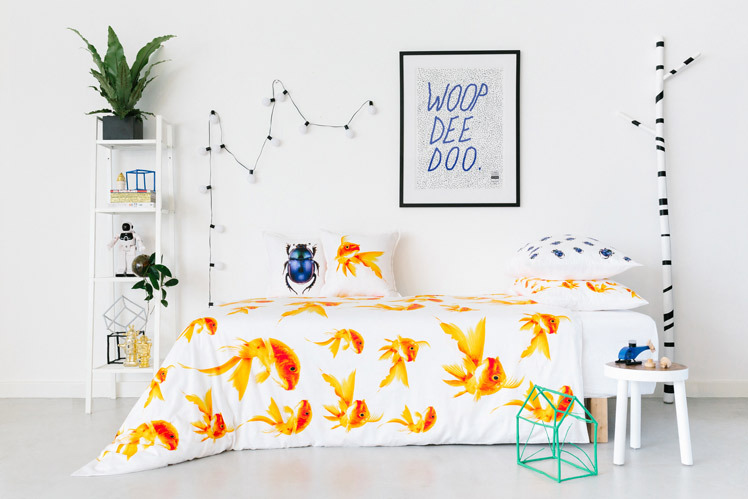 Nina had been trying to set up a range of adult sized bedding and Karin was working on a home wares range while also studying interior design at RMIT. Since then the project has moved fast. We are lucky to have a similar work ethic, so putting in as much time as our young families have allowed has seen the project really take shape. We design our styles from concept to reality, then use an extremely skilled manufacturing team of people to bring our visions to life. 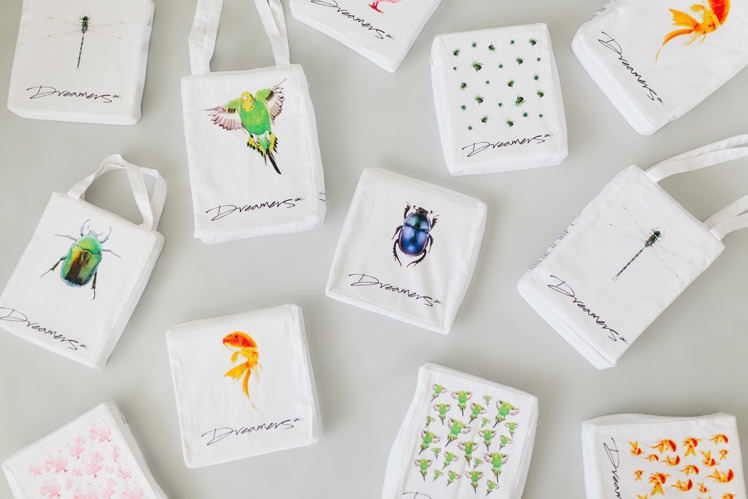 We are constantly exploring and looking for new and exiting items to add to the Dreamers range, so work and creative thinking happens around the clock. We sell online through our own website and wholesale to a selected group of stores we feel have similar aesthetics and fit the Dreamers Inc audience. When you buy a Dreamers Inc product you can expect unique design with uncompromising quality. As two self confessed textile nerds, we adore the feeling of soft beautiful textiles against our skin, whether it be pyjamas, linen or the cushions scattered on our lounge. 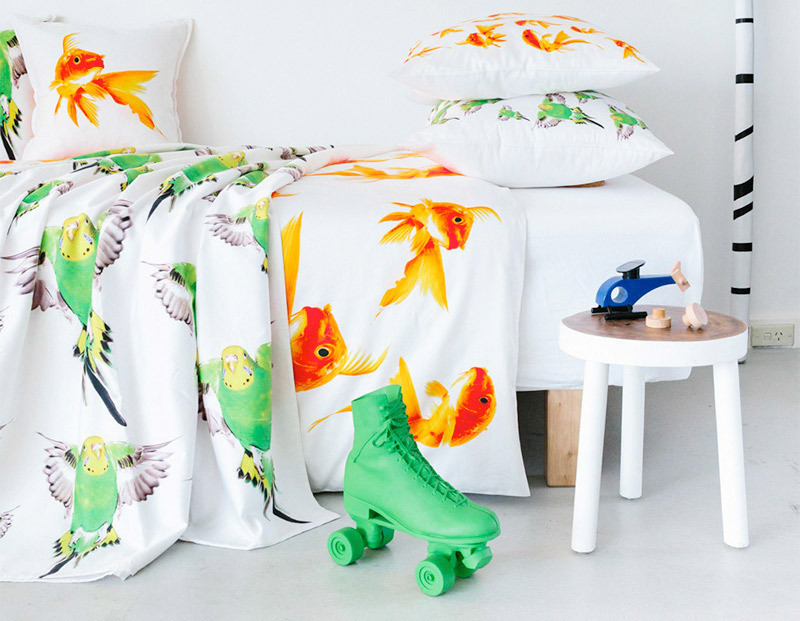 Dreamers Inc is currently producing digital print bed linens and decorative cushions. Our love of textiles has pushed us to explore new technical fabrics offered within soft furnishing. We can’t wait to show you when the samples are ready!!!! With backgrounds in fashion, textile design and manufacture, our skills set is far enough apart but linked just enough that we are able to take on different roles while still complimenting each other’s strengths and weaknesses. We wanted to create an independent business for ourselves. We feel that Mums out there have so much to offer, but finding the time to dedicate to a business is a big decision. 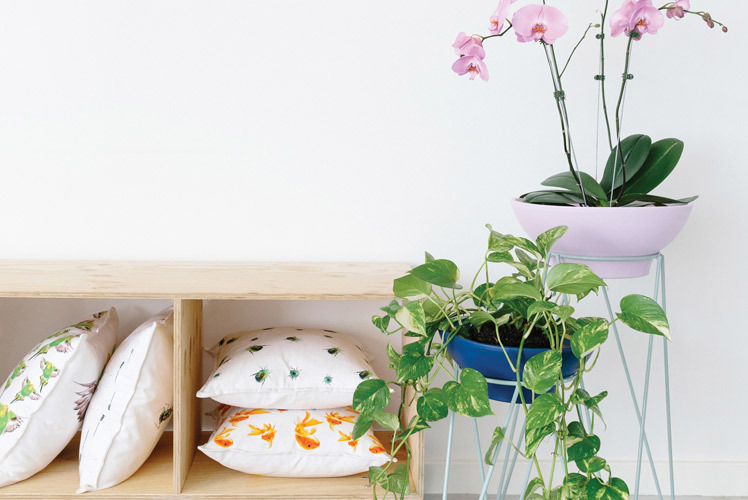 We love textiles and can’t live without good design. We were looking for a way to continue fulfilling our creative souls while maintaining the all important home life balance, so that we can really have it all. Karin: Since closing the doors to a fashion label I worked on for four years, I played around with many different ideas. I started a kids clothing range, was developing a café concept and many other small ideas in between. Nothing seemed to stick and I felt like I wasn’t sure where I was going in my career. I just knew I wanted to stay in the creative industry. The more time I spent at home I found myself styling and decorating the house and friends started calling for advice. I decided to take my love of interior design to the next level and enrolled at RMIT to further my study in the field. Nina: After finishing my degree (Bachelor Applied Science – Textile Manufacturing) I worked in quality control. It was very monotonous. I knew I wanted to manufacture my own designs. I was really inspired by the technology of digital printing. I still love it. There is so much scope for playing with scale and colour. I felt the best way to use the technology was in large format. I immediately thought bed linens. EVERYTHING! We just love exploring. Whether it is our daily Instagram fix or a weekend road trip with the kids. Beauty is everywhere you look, you just have to want to find it. Karin: At the moment I’m very inspired by art and landscape, for their colour pallets and abstract designs. I just very much enjoy the casual relaxed feel of the ocean. If I can’t get there in person I turn to imagery on Pinterest and books to draw inspiration. Nina: I have always loved Pop Art and colour. Lets get crazy! My kids are a constant source of inspiration and they show me the world in a new way each day. My husband is an awesome musician so our house is full of sound and colour at all times. I cook for relaxation, so I should probably say our house is full of sound colour and food at all times. A day in the Dreamers Inc design studio is very eventful. We start by throwing ideas around making suggestions, conceptualising and bouncing thoughts off each other. From there, research normally takes place like: Will this fit in the marketplace? Is there room for any more items of this kind? Will this fit with the line we have currently, etc. Once an idea is established and confirmed we move onto technicalities. Digital print technologies are relatively new in the scheme of textile manufacture. We have combined print technology and graphic design to create a valuable product with high-quality detail, vivid colour, and amazing feel. We believe understanding the possibilities of art and the computer will provide better digital print designs. So we develop our graphic layouts, patterns and everything else that needs doing to take our product from an idea to real life goodness. Both being Mums, we knew that product durability was imperative. We also wanted the product to feel amazing so we placed value on thread count and fibre type. We have used 400 thread count 100% combed cotton. It is soft to touch and detail looks photographically real while colours remain vibrant. Once we have achieved the product we set out to design then comes the hardest part in business: actually selling the range! Designing is awesome, administration is not so much… So for us, the biggest challenge is managing finances! As two “creatives”, finding the balance between doing what you love and actually turning it to a profitable business is really hard. It’s so easy to get caught up in creating the perfect product that you can lose sight of budget, but knowing what details will make your product stand out and what your buyers will appreciate is very important. As is finding the time to sit in front of a screen with data entry for hours and hours. Our manufacturing happens off shore because there are no factories with a print bed wide enough to accommodate digital print for bed linen on natural fibres. We experienced major delays in production and could do nothing but wait it out. We missed 6 months worth of sales due to the factories over committing themselves. Adrenalin is always high when capital and dreams are on the line. Our enthusiasm to keep creating and growing the business drives us to keep going even when times are tough. But seriously, we love good design, when form is not compromised by functionality. So our aspirations for the label all come from this starting point. We are happiest when the look feel and function of our designs are in harmony. We hope that Dreamers Inc continues to be recognised for design and product quality. Another major business goal would be to take dreamers overseas; we love travel and the thought of cruising around the globe while calling it work sounds very appealing. Where can I buy your doona covers? Best to ask Dreamers Inc directly about this. It looks like their website might be down, but you can try them on Instagram?